Buttermilk, the liquid left when milk or cream is churned into butter, has long added to the richness of North Carolina cuisine. It is the essential ingredient in the buttermilk biscuit-a southern staple that has become a popular part of breakfasts across the nation, particularly since being promoted by several major fast food chains. Buttermilk is also a main ingredient in such traditional foods as buttermilk pie, hush puppies, rolls, and cornbread. Evidence of buttermilk's role in North Carolina culture is its use in several place names. These include Buttermilk Creek, which flows from Caswell County into Alamance County and the Haw River, and Buttermilk Mountain in Henderson County. 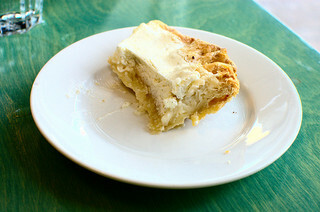 Vanilla Buttermilk Pie from Scratch Bakery, Durham, N.C. Image courtesy of Flickr user sleepneko. Available from http://www.flickr.com/photos/ejchang/5515339071/ (accessed June 12, 2012).